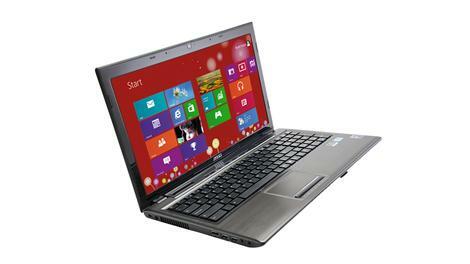 One of the hardest things to get right in a laptop is the balance between price and power. MSI has never scrimped on the latter – often offering specs that cater to the multimedia masses and the gaming crowd – but this usually means a high price tag. The MSI CX61 0NF brings a massive amount of power to those seeking a more reasonably priced machine, but it looks as if MSI has cut a number of aesthetic corners as well. This certainly isn’t a laptop for the style-conscious. Burdened with a rather bulky 380mm chassis, the CX61 isn’t going to win any awards for its looks. Its exterior is on the plasticky side, and is covered in a grey-black paint that is by no means offensive, but isn’t a colour you’d choose for your next car. Given the large chassis, the CX61 is surprisingly light. At 2.4kg it certainly won’t put your back out, but we can’t see you carrying it around too much – and one look at the battery results shows that it won’t last long away from the mains. We managed 125 minutes on a heavy load, which isn’t ideal if you’re thinking about gaming on the go, but that’s the price you pay for what are undeniably fantastic specs. This is where the CX61 comes into its own. There’s real power within the chunky exterior, with a Core i7 chip, GeForce GT 645M graphics card and a whopping 1TB of hard disk space. In practical terms, this equates to a laptop that is just as comfortable playing graphics-heavy games as it is handling everyday office tasks. 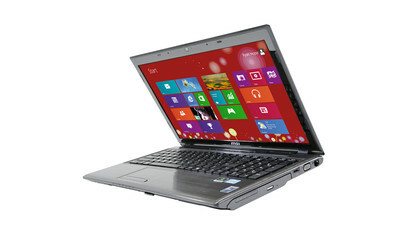 Unfortunately, this heavy duty nature doesn’t carry through to the build of the laptop. After a few hours use, we encountered a number of odd creaks and croaks. These mostly came from the laptop’s hinges, and while this never felt like it would impinge on daily use, it could be a little sturdier. The keyboard was rather flat to type on as well, which points to a design that caters more to the gaming side of things than boring, functional tasks like word processing. The focus on gaming is also visible in small changes to the standard keyboard layout. The [Windows] key (which is used to flit between the Start screen and the desktop) isn’t where you expect it to be. It has been shunted to the right to suit gamers, and keys like [Shift] and [Ctrl] have been enlarged. There are also full-size arrow keys to keep the gaming clique happy. These subtle changes worked well in our tests, even if the keyboard was ultimately let down by lack of sensitivity in the touchpad. The screen on the CX61 is a joy to use. It may take some getting used to – given that it has a non-glare finish – but you’ll soon be thankful, due to the lack of shine getting in the way of things. It’s Full HD too, ensuring your movies and games look fantastic. Connectivity-wise, there’s a HDMI socket, two USB 3.0 ports, one USB 2.0 port, a memory card reader, microphone and headphone jacks and Bluetooth 4.0. 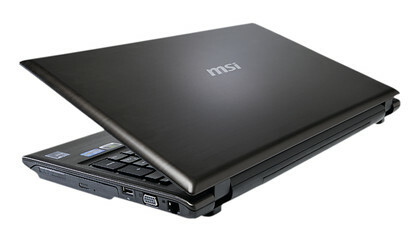 The MSI CX61 is undeniably a powerful machine, but it’s wrapped in a bubble of design mediocrity. If you can see beyond the bland chassis, then you’ll be gifted a computer brimming with specs that wouldn’t look out of place in a laptop costing twice as much.